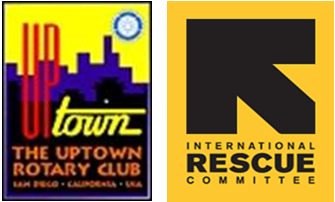 Mark your calendars for the annual San Diego Uptown Rotary Holiday Party, Wednesday, December 9th at 57 Degrees Club from 6-9. You can purchase tickets to the event ($30 for one or $50 for two) at the Eventbrite address for the event. The proceeds from tickets sales will be donated to The International Rescue Committee (IRC), which assists refugees coming to the United States from abroad. Please share this invitation to your friends and invite them to Uptown Rotary's Holiday Party. We hope to see you all there.